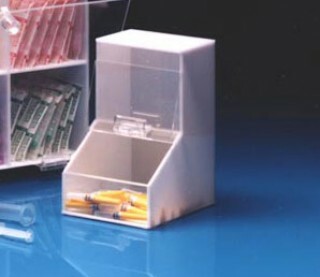 The Mini Dispensing Bin provides for storage and dispensing of small items. The clear front allows for viewing of items to alert user when the reload is needed. There is a clear, hinged door for easy access. It may also be used with the Mini Dispensing Bin, ML- 2550.